Disclaimer: The OC Studio Orpheus MK5 sent to us for the purposes of this review is a demo unit sample and does not have to be returned. Thank you to Original Cable Studio (OC) for giving us this opportunity. OC Studio stands for Original Cable Studio and is based in Taichung City about a few hours drive south of Taipei in Taiwan. This is a brand of cable makers that surprisingly has a low profile outside of the Asian region but every time I mention the name in Asia you get a big nod of approval. Pretty much everyone thinks highly of David Lin’s boutique company and the range of cables they offer. Now I spoke to them ages ago, and if you have been following our cable reviews you will have noticed I have mentioned the Orpheus MK5 more than a few times as a direct comparison. It is perhaps the cable (up until the EA Janus Dynamic) that I take with me the most, use the most and eulogize about the most everywhere I go. Why? Because this cable sounds so ridiculously good for the price. 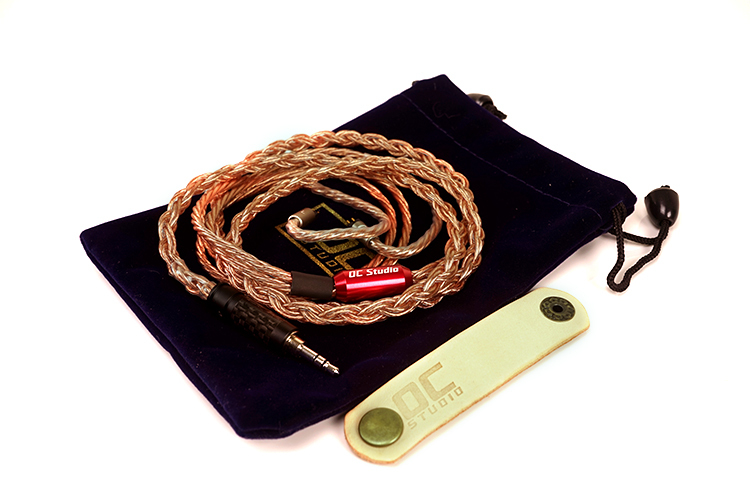 This is an 8-wire Cryo-treated UPOCC single crystal pure copper cable that looks great and sounds amazing for just $250. Even better, if you are ordering in Taiwan you can get this for much less. It is a bargain, which is rare in audio these days. OC Studio has six core cable brands under its name. These include the entry-level OFC 4-wire Ares MK2, the Orpheus MK5, OCAuX, The Monarch (a review coming soon), UP-OCC Silver Zeus and Grace. The prices range from around $50 for the Ares MK2 to around $450 – $500 for the OCAuX & UEX (UPOCC silver gold plated & UPOCC Silver) Grace 2. 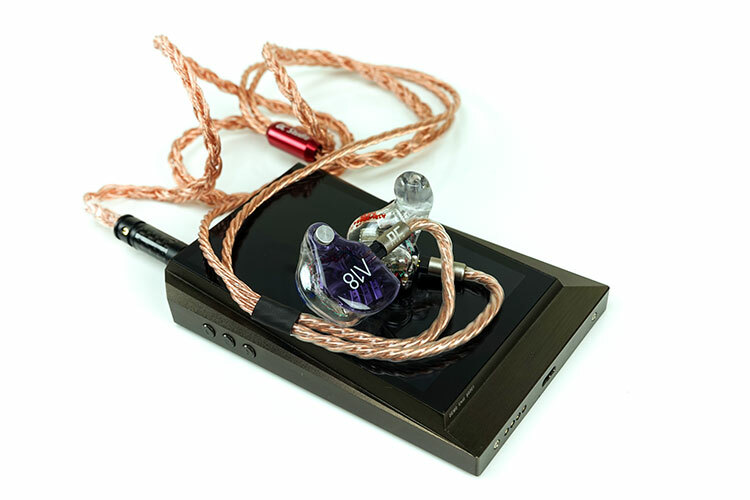 The Orpheus MK5 8-wire is his TOTL pure copper cable and is priced at a modest $250 at some of the international dealers. Hunting around online I was able to find a direct Taiwan outlet for OC Studio called Ruten where the 8-wire is priced at NT$3999. If that is correct this is a crazy US dollar price of $130. I get a feeling those this is just for local buyers but feel free to try. Almost all cables come in either 8 or 4 wire versions with various blends of wiring metals, connectors, and finishing so the price can vary somewhat. You can also get the Orpheus MK5 in a 4-wire edition that is even cheaper at around $150 International SRP which places it on par price-wise with popular cables such as the Ares II from Effect Audio. The Orpheus MK5 is at heart a big ‘fat’ copper cable. The wiring is a healthy 8-wire 24AWG Cryo-treated UPOCC single crystal pure copper. There is no fancy exotic mixed plating to be found anywhere which does help keep the costs a lot lower. UPOCC, or Ultra-Pure Ohno Continuous Casting, is a process of refining wires to create a larger crystal size and maximize the purity content of the wire, usually to a 7N level. 7N basically stands for the purity level of the OFC copper wire used. This is how purity is defined when acquiring alloying materials. It is not a wholly accurate measure as there are the absolute purity and the common metals basis of purity debates. It is generally taken as an approximation but the N stands for numbers either side of the decimal point. In this case, 7 numbers or 99.9999%, which is a pretty high level to achieve. You will see lower purity standards such as 5N and it works in the same manner at 99.999%. The numbers above give you a broader understanding of the entire range used. The gauge is thicker than your typical 26AWG variants you get at this price point. The size of each individual wire at 24AWG which is 0.511mm diameter and 49.7 turns of wire. This is 20% bigger physically than a 26AWG wire and around 30% more turns of wire. 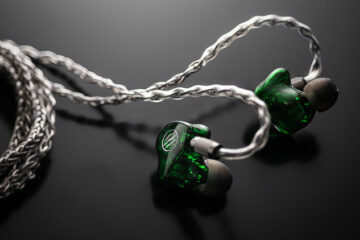 The 8-wire configuration in the Orpheus MK5 is physically right on the limit for me for IEM cables. However, it should, in theory, give a better performance in terms of dynamic range and lower resistance. The build quality of the Orpheus MK5 is excellent for the price point and it looks really attractive also in its translucent jacket. I am told now you can get this in a range of colored jackets including all-black which some may prefer. My preference is for copper cables to shine like copper. There is also a slightly more expensive version Litz structure version of the Orpheus MK5 which is more resistant to oxidization. However, having had this cable for over a year now I have seen zero oxidization or shades of green creep over the wire. The black jacket option may also suit those who worry about those things. Being an 8-wire though it will be a touch heavier and not quite as pliant as 26AWG variants such as the Tri-Copper from Plussound or the Thor II and Lionheart from Effect Audio. That being said, it is very easy to work with and marginally lighter and more flexible than the EA Ares II 8-wire. Actually, the Ares II 8 -wire feels huge in comparison even though its a smaller 26AWG gauge. The cabling is also a tightly braided design similar to how Effect Audio does their cables. This is a style of braiding which I much prefer over the looser wraps on Astral Acoustics Taurus and Libra. It gives it a certain level of strength, prevents unintended “flyaway” effects and prevents even marginal memory retention in the wire when you unwrap it. The jacket is not declared as PVC on the package description or website but it has the same look and soft feel as the Ultra-Flex PVC on the Ares II 8-wire so I presume it is. PVC is a step up on older PET jackets which tend to be much stiffer. The Orpheus MK5 8-wire is terminated with OC Studio’s own custom-made jacks and connectors. Even the lightweight red-colored aluminum y-split barrel is in-house made. These are not off the shelf plugs imported and then wired up. OC Studio has labeled them as OC 35CFRT jacks and these also have been cryo-treated like the copper wiring inside the cable. They do not look cheap, in fact, they look excellent with their logo pressed on the carbon fiber style central band and finished with a matte black top and bottom. You can take them apart with a small screw at the top also so they are quite flexible. The strain relief behind is a quite thick though. I am all for good strain relief but it is a little long for me which exaggerates the bend from the jack a little when connected to DAPs. 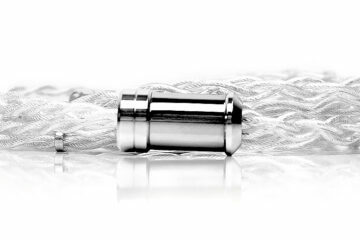 The connectors that came with this cable are a standard 2-pin 0.78mm design though you can get a wide variety of alternatives such as MMCX and Fitear as well as full-sized headphone sockets for Sennheiser and AKG should you wish to make a headphone cable variant also of the same wire. The design is closer to Effect Audio in construction though the coloring is more anodized aluminum than chrome. The barrels are branded with the OC Studio logo to face outwards and a left and right print on the inside to face inwards. 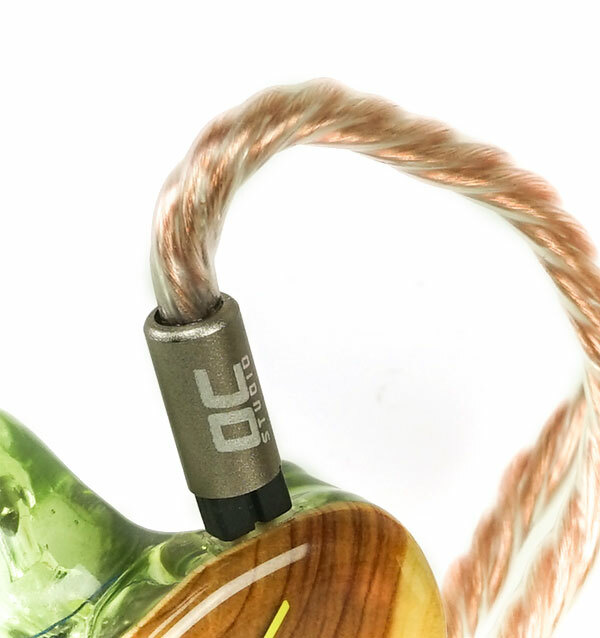 For an 8-wire the Orpheus MK5 is very comfortable around the ear. The memory hooks are quite long actually but they are made of a similar translucent PVC material so they are fairly soft and do not apply any nasty pressure pains on the back of the ear. I do find this cable to be a bit more comfortable than the EA Ares II 8-wire which is a smaller gauge also. It may feel a bit heavier around your ear though than 4-wire versions but it is not as flyaway as the looser braided Astra Acoustics Taurus so it easier to manage. You may find a tiny bit of dull microphonics running up the cable, especially with a tight sealing custom monitor. I tend to find the additional girth of an 8-wire can sometimes create a little more noise than the 4-wire variants but its fairly minor. The packaging is really spot on for a wire at $250 or less. Some of the things I look for in competing packages are all there such as a small branded soft carry pouch and a leather cable organizer strap. You really do need those straps for cables of this size to keep the loops tight when carrying them around. 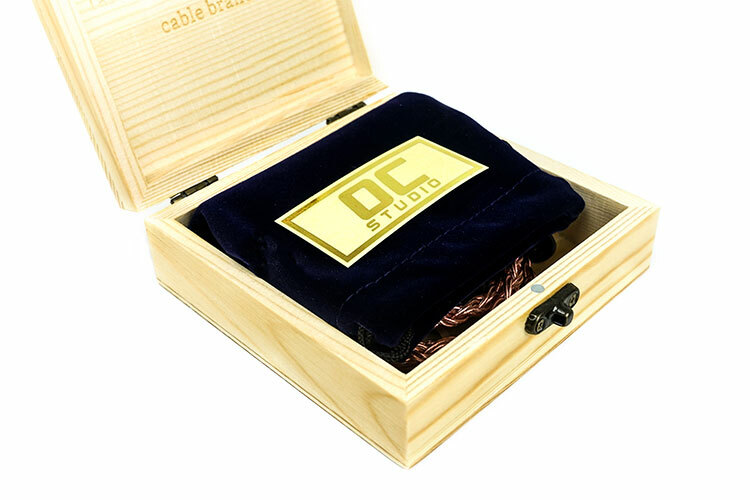 Beyond that, the cable and accessories come packaged in a nice little wood grain container box with a metal hook latch. It also has a label on the bottom outlining what exactly is inside the box in terms of wire, connectors etc. It looks the part, to be honest, and something that raises the bar a little for cable products at this price point. Sadly not tried the ZX300 but I do notice from time to time that my 1Z treble can be a bit digital in tone. If the treble is similar I think I’ll be perfectly happy with the mk5, you’re probably correct that the loss in bass is drawing attention to the treble. I’m using a Sony ZX300. Thanks for doing the comparison. Well I just tried the both of them there now on the Dorado and most certainly you will get your low-end back with the MK5. I think the treble is not hugely different on either but the slight reduction in bass on the Ares II 8-wire might draw more attention to its treble presence than the MK5. Honestly I dont find either of them that bright on the Dorado, may I know your source? I am using a Sony 1Z. Hi, I have the Litz cable that came with my campfire audio Dorado IEMs and with my current source, I wanted more treble out of them. I got the effect audio ares II but lost some bass with them and the treble is bordering on too much. Would you say that the treble of the MK5 is between the two? Thanks. Hi Jerry, actually in Taiwan I have seen it as low as $150 which is crazy but its end of life now with the Litz version taking over. Slightly more expensive but just as good. I am prepared to put up with 8 wire in all honesty I love the jump in dynamic range. To be honest yes. Choose 5.5 instead. 5.0 Do have this problem. Hi. FYI. I ordered it from China and it was about CNY 1185（if you choose a better FURUTECH jack you would CNY 200 more) for the eight wire MK 5.5(Litz), which is about $200 for this super cheap but powerful wire. Actually I think their new Montana copper cable sounds better. I got its limited 6-wire version and it’s my favorite copper cable! Actually has not done that for me so far but they do have a Litz wire version which they are pushing to eventually replace this one. only issue is the non-litz wire oxidising after a few months.